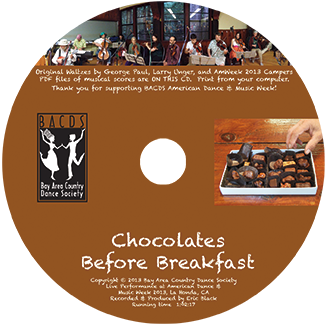 Fourteen original tunes recorded live at BACDS American Dance & Music Week at La Honda in July 2013. Includes background sounds in the dining hall before and during breakfast. The enhanced audio CD includes PDF files with sheet music for all tunes. Click on the link for each tune to hear a brief excerpt. — This waltz started when George was hiking on Fresno Dome in the Sierra. It gets its name from a session early one morning after camp at Eric & Diane’s house, making sweet music and eating chocolates while we decided what to have for breakfast. — This waltz really isn’t titled “1746”. It has no name yet. It’s the 1,746th unnamed tune written by Larry Unger in his notebooks. Larry is a very prolific composer. Perhaps this tune will have a name by the time this CD is in your hands. Or perhaps Larry could name it per your request with a donation to AmWeek! — While working on a small remodel project, George was aware of the wonderful interplay between Helen and her 10(?) year old daughter, Brook. This tune captures that loving, laughing, gently teasing feeling. — Written as a class project by the members of Larry Unger’s tune writing class at AmWeek 2013. AmWeek occupies the “Wasiata” village at the Jones Gulch YMCA camp in La Honda. — Commissioned by Erik Erhart at Stellar Days and Nights in Colorado. It was snowing, with log cabins, big trees, elk, and great company. The tune came to George a week later with memories of the camp fresh in his mind. — Larry has performed at the Wheatland summer music festival several times, and this past year spent much of the last evening dancing to a local Cajun/Zydeco band. On the plane on the way home he tried to recreate the feeling of the music from the night before, and came up with this tune. — George was working on a classical piece and broke off to go have dinner with Laura, Adina, and friends. On returning home, this waltz was born. George gave it to Adina, only to find it was her birthday! — George wrote this after listening to the waltz CD [Spyglass: Waltzes] by Rodney Miller and his daughter Elvie over and over again. Rodney and Elvie have been on staff at AmWeek in the past, and participated in the “More Waltzes Before Breakfast” camp CD — please check out both CDs! — Jamie asked for a “really pretty” waltz for his wife and this appeared a week later. — This waltz came to George at 6am in the morning in Colorado at Stellar Days and Nights. It is dedicatd to Sally, for whom it was purchased at the silent auction. — Written in September 2012, for Loren and Hilary‘s newborn daughter, Kora. — Sometimes, while we are living our lives, bad things happen. This tune was born at AmWeek 2013, and that same evening we learned of the reason. Truly, The Angels Were Watching that day. Thank you for being with us.